A rainscreen façade is a sophisticated approach to moisture control where a two-level construction system provides superior waterproofing, long term durability, and thermal efficiency. 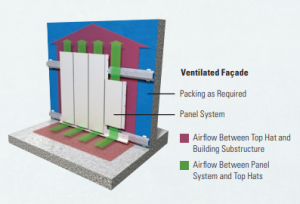 The key attributes consist of the outer cladding, the cavity, and the air and vapour barrier, that work together to provide a modern, innovative and cost effective option for many developments. The durable, non-porous material of the outer cladding is intended to repel most of the rain and moisture. Behind this is the functional cavity that enables drainage and allows air circulation to promote evaporation and drying. Finally, the air and vapour barrier is the final line of defence that prevents water from infiltrating the building’s structure. Rainscreen facades are typically considered to be 2 types – Drained and Back Ventilated; and Pressure Equalised, as classified by the American Architectural Manufacturers Association. A third commonly used is the Vented Rainscreen. An excellent integration of a ventilated rainscreen can be seen on our intelligent aluminium façade system, Stryüm, that minimises environmental impact and creates a more thermally regulated building interior. It is one of the most effective cladding options on the market today.